A Scottish tradition, originally Sgian Dubhs were commonly worn under the shirt close to the armpit. Now the "stocking dirk" is traditionally worn in the stocking of the Highlander. 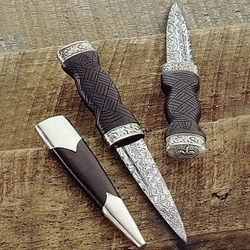 The term "Sgian Dubh" itself actually means black handled knife. Our Damascus Sgian Dubh which weighs less than 2 oz. and has a black wooden handle that is carved on one side, smooth on the other. Embossed nickel silver fittings feature a thistle motif, comes with a sheath. Can be sharpened for additional fee.